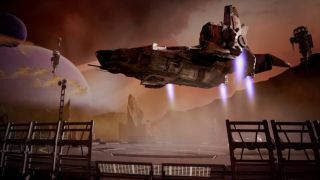 Piranha Games did a pretty solid job with Mechwarrior Online , but now the studio is trying its hand at something even more ambitious: Transverse, a flight-based sci-fi MMORPG set in a distant part of the galaxy where humanity has transcended mortality, and the players control everything. In some ways, Transverse sounds similar to Mechwarrior Online, particularly with regards to combat. "The physically-inspired close range combat will require strategic management of your ship's systems. With each burst of weapons fire, high speed turn, and shield deflection, your ship will expend power and build heat," the game's description states. "Every battle you engage in will play out differently." But it's the story that ties those battles together that makes Transverse sound so potentially interesting. It takes place in the 24th century in an area of space known as the Fringe, where four factions of humanity vie for supremacy. But years of augmentation and enhancement have created "humans" far different from those on Earth, while the advent of synthetics has rendered mortality irrelevant; now, the people of the Sol system live in a closed, rigid society, while out on the Fringe, the only laws are the rules that each man and woman chooses to live by. That freedom will extend to the in-game economy as well, as there will be no stores, pre-made mines or manufacturers. Instead, players will have to establish themselves with nothing more than the "humble colonist goods" they're granted when they enter the Transverse, and create and grow the economy themselves, as they see fit. It all sounds rather EVE Online -like, while the reveal trailer strikes me as a cross between Battlestar Galactica and Firefly, with a dash of Babylon 5 on the narrative side. But that's not a criticism: Original ideas are nice, but a mashup like that—if it's done properly—is something I'd throw money at all day long. Speaking of which, there is a crowdfunding campaign. Pledges start at $30 for a basic, all-digital package, and go all the way up to $250, which includes all kinds of cool physical stuff like a map of the known universe, a hardcover "making of" book, a pin and a t-shirt. Transverse is by all appearances an incredibly ambitious project, and that makes it risky—especially since Star Citizen and Elite: Dangerous are already so far along. But the possibility that it could live up to those ambitions makes it worth paying attention to, which I thus urge you to do at TransverseGame.com .